Never before, since My Crucifixion, has Christianity endured such persecution because of contempt against the Word of God.All that is held sacred in My Father’s Heavenly Kingdom is being decimated by man, whose heart no longer feels love for his Creator God the Most High. Those who remain faithful to Him, and who love and cherish Him, will feel His Pain within their hearts like a sword, which pierces and inflicts terrible suffering but which will not kill. For those with true love for God will be unable to separate from Him because they are attached to Him by an umbilical cord, which cannot be severed.God, through His Mercy, will destroy His enemies who try to steal the souls of those whose names are contained in the Book of Life. My Time is almost upon you.Never give up hope or despair, when you witness the work of My nemesis and the speed by which his cunning wicked ways are accepted by unsuspecting souls. I am firstmost a God of Great Patience and My Mercy will be poured over the human race in abundance amidst the flames of My Love. These flames will instil a renewal of faith in Me by those who have fallen away from Me, just as they will destroy Satan and every demon and fallen angel who hold hostage those souls who belong to Me,but who have separated from Me. My Time will come, but not before the world will see the signs foretold in the Book of Revelation and the Book of Truth. Do not fear Me. Prepare for Me. Reject the false promises made by My enemies. Remain true, always, to My Word. My enemies will have no part in My Kingdom. My beloved faithful, including those who call out to Me, during the Warning, will never die. For theirs is the New Kingdom – My Kingdom – the One promised to Me, the Messiah, the King for all time – a world without end. This may be a time of confusion, division, sadness and a longing for those who represent Me on this earth to proclaim the Truth. But know this. I Am the Truth. The Truth never dies. My Kingdom is eternal and you, My beloved children, belong to Me. Come. Stay close to Me. I will lead you to your rightful inheritance. Trust in Me. 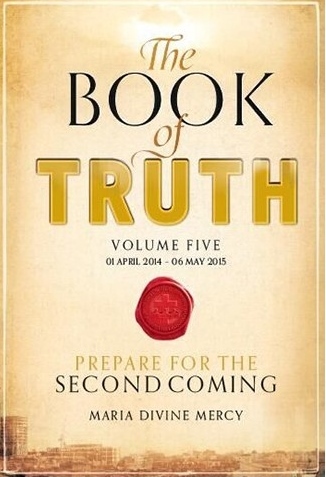 Listen to Me through these Messages – the Book of Truth. It is God’s Gift to you so that you will never forget My Promise to come again to judge the living – those alive on this earth as well as those who died in My Favour. I will show signs of every kind all over the world now. Those who are blessed with the Gift of the Holy Spirit, will know they have been sent to you by the Command of My beloved Father.Go in Peace. Listen to Me only through these messages at this time.